Hearts to the Rescue: LOOPY HAS A NEW HOME!!!! ADOPTED! ADOPTED!! WHO AM I? My name is LOOPY. My mom passed away and now I need a new home. 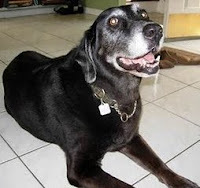 I'm an old girl, but I love people and animals. Please help me find a good home to live the rest of my days in. I'm all by myself now because the place I'm at doesn't like animals. I really need your help. 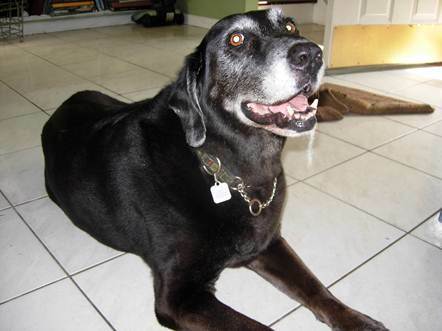 Name: Loopy - Dog; Female; Lab mix; Color: black; Age: 10 y/o; Weight: appr 60 lbs; Special note: senior dog, having some trouble getting around, slow moving. See note below. NOTE FROM LEA: I am in desperate need of help. My mother passed away last week and left behind 3 dogs and several cats. My building does not allow dogs, and I am not financially able to move to a new apartment right now, so I am taking the cats, but need to find homes for the dogs. A shelter has agreed to take 2 of the dogs back (my mom adopted them from there), but I need to find home for her Lab mix, Loopy. It is breaking my heart because I love these dogs, but I can only do so much. Loopy is staying with my sister for now, but she is not an animal lover, and is rarely home, and really just does not care. I live 1 1/2 away (in the city), and do not have a car, so I cannot go there often. ... I do not think she would last long in a shelter... she is having trouble getting up and down, and has slowed down considerably. I really want her to be able to live out her final years (possibly months) in peace. She lived her entire life with my mother, who was home most of the time, and is not used to being alone. She loves people and other dogs, and is good with cats and kids. She is super sweet, a bit goofy, and loves food and going for walks. She is housebroken, but really needs to be on a schedule to avoid any accidents. She cannot walk up and down too many stairs, so would need a place on the ground floor or with an elevator. She has been so depressed since my mom died. She is about 60lbs (this is just a guesstimate).